We're in Day 9 of the 31 Days To Telling Your Story challenge. Or Day 4 if you're me, but I think I told you I was aiming for 20. Possibly overly optimistic on my part, but I'm going to try. The thing is some of these word prompts are hard. When I blog I like to tell stories. There are other bloggers out there sharing deep bits of wisdom and I'm just over here talking about my grandson and what I ate for dinner and in general giving you too much information about the everyday ordinary. Secretly I think many of us are longing to read about ordinary. It makes the world seem a little less harsh. Hmmm...maybe I shouldn't have skipped Saturday's one word prompt which was 'belong'. Let's move on because I'm supposed to do this in five minutes flat. Ish. Our house faces east. I think it's east? That's where the sun rises, yes? I'm kidding hubs! He knows directions are not my thing, so he might not believe me when I say I know this, but I know this. When we were walking lots in search of a home site some three years ago we purposely looked for a lot that would allow our house to face towards the east. In other words we opted to wake up with the sun rising out our back door. I'm an early bird so I rarely miss the sunrise. If you follow me on Instagram you know I post too many pictures of the sky at dawn, especially this time of year. October skies are the best y'all. We have a picture perfect view of the sunrise from our back porch which is where I head first thing every morning. 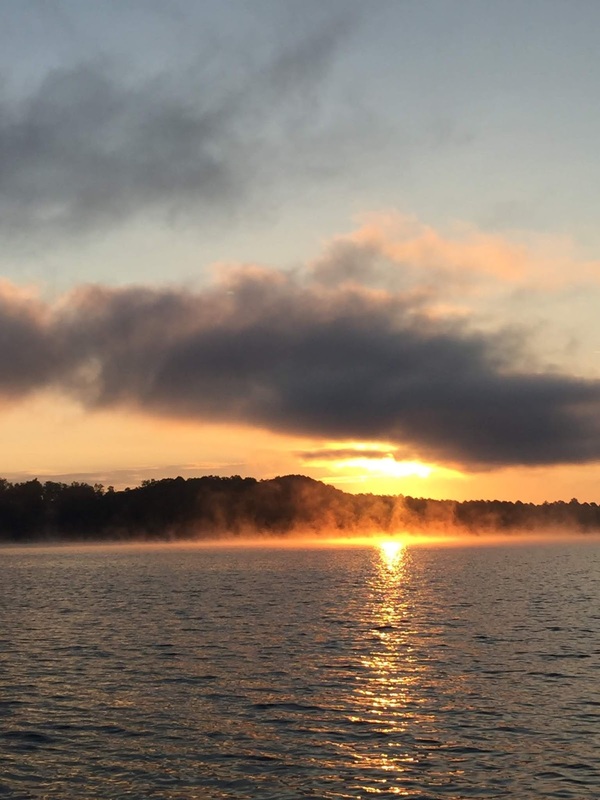 One day last week hubs suggested we get up extra early and take the boat out so we could watch the sun come up from the middle of the lake. We brought our coffee in a thermos and a blanket for our lap and sat in the quiet stillness of a morning not yet broken. The sky at sunrise inspires me. A visual reminder that every day is filled with fresh mercies. That it's never too late to be kind, seek forgiveness, try again. Start. I've seen a lot of sunrises and one thing I've observed is that a few clouds in the sky somehow make the beauty more beautiful. Pretty sure there's a metaphor right there for the taking. You and Wendy are doing so well with this October challenge! Yours today was INSPIRING with each word and photo! Well, I'm pretty sure Iwould have been more than a little inspired if I had seen that gorgeous sunrise while being out on the lake. Great post! I could not agree more with your post, except for the early riser thing, but your love of watching the sun rise and what it means to you is so spot on. As a grandparent I love reading about others who are relishing the grandparent role. It is one of life’s greatest blessings so please continue to write about your Man Cub. I enjoyed reading your post. What stunning photos! The sky, no matter if the sun is coming up or going down, even just the clouds in general seem to inspire me. Our Creator paints us a different picture each day...just like His mercies are new every day like you mentioned. Beautiful post! Hi Joyce... I'm the worst when it comes to directions. I think it's genetic - my parents were awful too. Great pics of the sunrise. Have a good weekend.